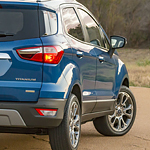 Ford EcoSport Provides Unparalleled Capability | Dean Arbour Ford of West Branch Inc. Inside, the EcoSport give you the versatility you need to transport passengers and haul cargo. Customize how you stow gear with an adjustable rear load floor and shelf. Available cargo nets and organizers give you even more options. With the 60/40 fold-flat rear seatbacks, you'll have even more room to load and transport everything required in your daily runs.